Speaking broadly, there’s really no other venue quite like elsewhere. Hidden amongst the other flair and noise of the Surfers Paradise sprawl on the Gold Coast, this club sets itself apart from the rest by putting on nightly raves built for escapism. Tonight’s headline band were primed to do just that—take you away from your inhibitions and release your wild side. Enter Tesla Cøils—the most ferocious and avant-garde duo to grace the city. Before Tesla Cøils infested the venue with their grim, monochrome upper; mind-altering production, it was Lotus Ship’s duty to set the night’s tone. Recently taking some time away from the scene and going through a lineup change, Lotus Ship would have a record that could be shared by both you and your Dad. Not to say their music rests on its nostalgic laurels, though. It’s incredibly tight and confounded into a melange of rock, funk and some psych thrown in for good measure. Not to mention frontman Mitchell Watterson conjuring some magic over the early crowd to get on their feet. Høt Coffee may be the youngest geniuses on the Gold Coast. In the studio, they’re mainly a two-piece—held together by Matt Hansford and Wade De Souza—though live, they inject just a touch more groove into the fold with the addition of a bass player. Their beats are potent and Hansford’s ability to shift from rapping and signing is undeniably intuitive. It’s been thrilling to see Hansford develop as a frontman, as he embraced the shuffling crowd, even getting up on the speakers and entering into their fold. They loaded their 30-minute set with a couple of new tracks—one of which features rising star, DVNA. In usual fashion, they close the set with their ultimate crowd pleaser, Magic. Its chorus is a truly perfect pop entity built off samples and merely enhanced with the live bass. If you weren’t moving to the beat of Høt Coffee’s rhythm, there’s something wrong with you. Tesla Cøils—the duo of Jed A. Wolters and Chris Dennis—have been relatively quiet in recent times. 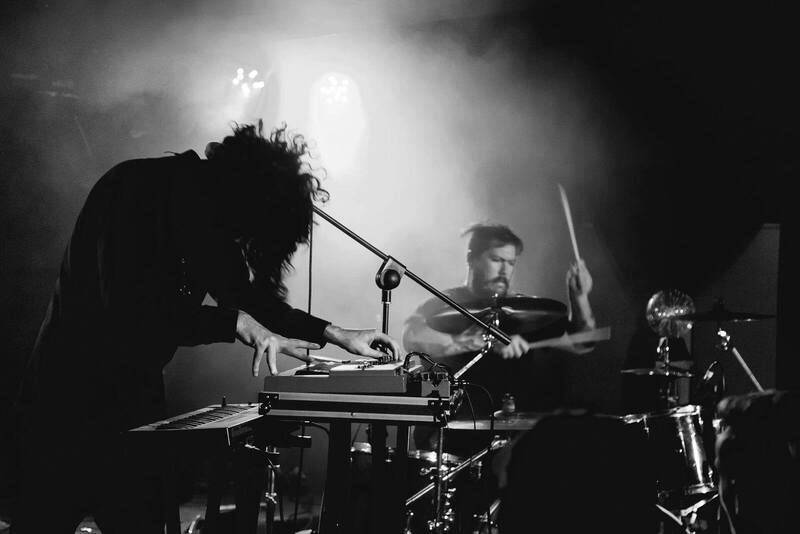 However, they chose January to unleash their new opus single, Dinosynth—a carnivorous collision of piercing industrial synths and universal rhythms. Before then, they’ve been bunkered down writing music and elsewhere was their destination to let it all out. Tonight, we were Tesla Cøils’ test subjects in their freaky, dimly lit scientific cavern. The Gold Coast Music Award-winning band ran through a slew of new material on the elsewhere audience, including a perplexing tale titled Hunter Thompson. This track sparked the slow, more methodical side of the band’s sonic asphyxiation, though it was Wolters’ stirring storytelling and ravenous delivery which sealed the deal for this unheard piece. Speaking of captivating, another new track, which was introduced as a story of “living with two dogs, a rabbit, your girlfriend and your girlfriend’s mum,” could only be executed through Wolters’ signature dry wit and abnormal grasp on songwriting. Wolters is the perfect frontman as he goes into his performance threefold. In person, he is a friend and buoyant human being; on stage, he attains a domineering and absorbing presence that bleeds into his third transformation—the characters in his songs. While some songs are sung from his personal experiences, its the more fantastical tracks—such as the space opera of Dinosynth—that allows Wolters to embed a new persona on the stage. For the uninitiated, laying beneath all this lyrical madness, is Tesla Cøils’ signature sound—that of sharp, florid synth strikes against a plaintiff ’80s industrial background set to pummelling drum beats only Dennis could conjure up. Although Tesla Cøils’ music is dark doesn’t mean there isn’t joy to be found. That sly flip—the thrill and release in activating anger—is the emotional ingenuity in the group’s music. It was impossible to centre my attention on either member. I was struggling to decide whether to focus on Wolters’ flailing showmanship or Dennis’ intensifying drumming. Whatever side you chose, you chose correctly as each member of Tesla Cøils gives their all. As the set closed with a Joy Division cover, it became apparent just how much Wolters was imbued to the music. Almost like an act of witchcraft, Dennis’ powerful sonic vibrations overcame the frontman as he flailed all over the cramped elsewhere stage. His performance was intense as the 40-odd minutes of serpentine ambiguity came to a thrilling conclusion—it was an exhaustive and expletive finale that drew everything from the two members.